Harvesters have long been one of my favourite restaurants whether that's a romantic sit down meal for two or a family meal for four (or nine in our case). We forever visit the Bentleywood farm harvester which is a traditional looking pub on the outside as well as the in, the atmosphere is very friendly and fantastic for families with the service being exceptional. I've visited on many occasions, and thought it was time I wrote a little review. On arrival we ordered drinks, I went for a mocktail which is a non-alcoholic drink of strawberry lemonade which is part of the Summer drinks menu. 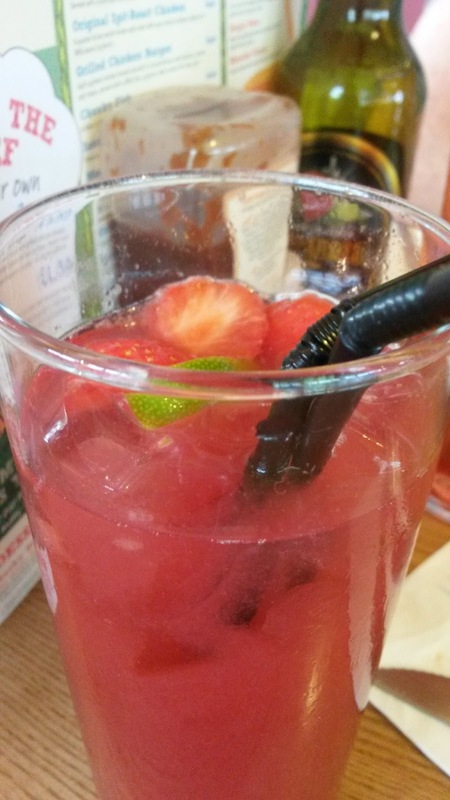 The drink it's self was fresh whilst being sweet and had a garnish of lime and strawberries. We then helped our self to the unlimited salad. The salad bar as everything you could want including pasta, brown and white bread rolls and lots of different sauces, I had honey and mustard which was so delicious. I went for the Grilled Salmon, I find that I often go for salmon as it's not something I get to have often due to having an household of fussy eaters. 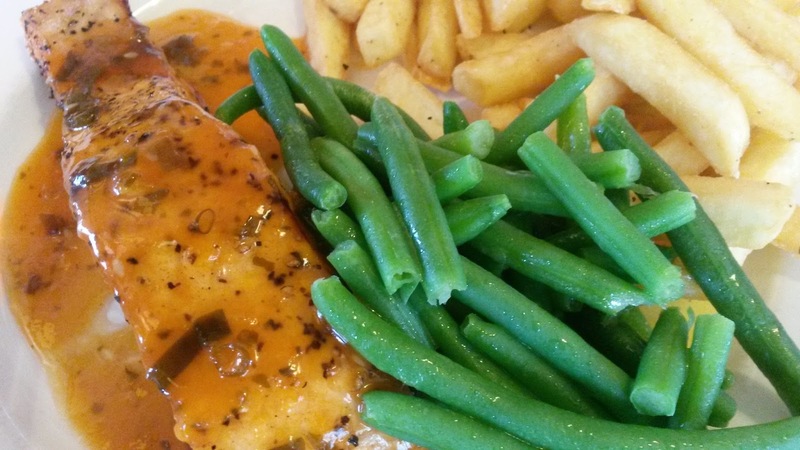 My grilled salmon came with green beans and seasoned fries, the sauce I chose was a little different chilli, ginger & spring onion, the sauce was very delicious and was a sweet chilli rather then a spicy chilli. Bad quality photo, took this in the car whilst it was moving. From time to time Harvesters do some great offers, we managed to get an offer of six free sundae bests, sundae bests are an ice cream sundae of vanilla ice cream with sauce of choice including; chocolate, strawberry, raspberry and toffee sauce. They were nine of us, two children weren't having desert so I decided to order something different. I wasn't hungry but the great thing about harvesters is you can take certain deserts away - good news if you have a sweet tooth like me. 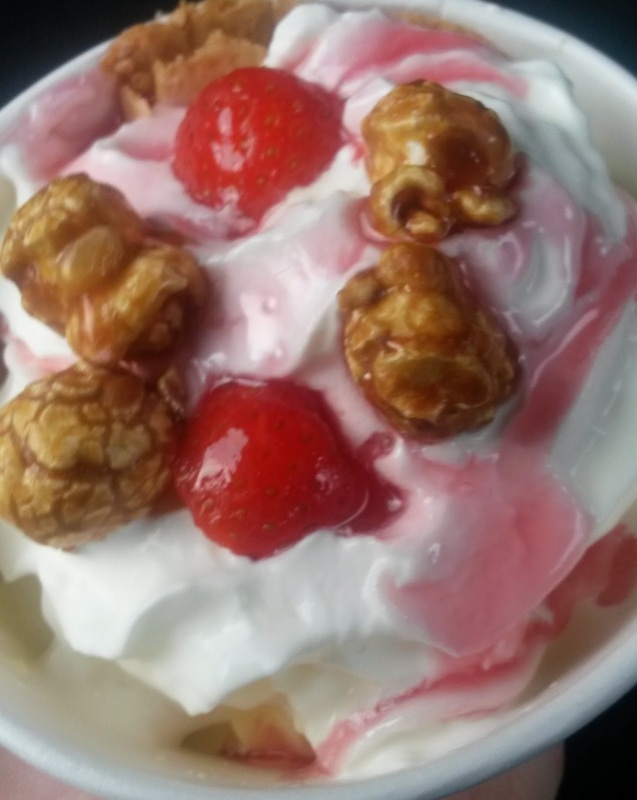 I got strawberries and cream crunch which is; Fresh strawberries, caramel popcorn, meringue, vanilla ice cream, strawberry sauce and a generous helping of whipped cream, topped with a crispy wafer - I enjoyed this whilst watching the soap awards, it was tasty and fresh. I love harvesters it's a great restaurant, with a lovely atmosphere and amazing food - I can't wait to go again. It's also great value with the free salad bar isn't it. Sounds like a great place... that salmon looks so delicious and is making me very hungry!